We supply numerous types of temperature & humidity data loggers and for all segments such as healthcare, food processing,hospitals, laboratories etc. 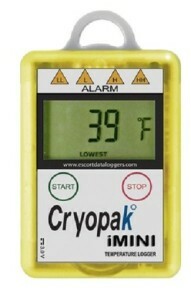 The iMini series of temperature data loggers by Cryopak, USA are available in single-use and multi-use models. The operation is by simple Start and Stop buttons. The data can be downloaded by a simple USB cable which can be plugged in at the back side of the device. Available Models are Temperature data logger, Temperature, and Humidity data loggers. The range of measurement is from -40 °C to +80 °C. It has Large LCD display with multi-function viewing capabilities. There are 4 LED alarm indications, 2 for Low alarms and 2 for high alarms. Customizable alarm settings and programmable start functions are available. The data is downloadable via USB cable, no proprietary software or interface required. Provides maximum data logging reliability and accuracy at a low cost. User-friendly multi-language software for easy programming and download. Available from memory capacity of 8000 to 124000 readings. Temperature and Humidity data loggers start from memory capacity of 16,000 readings. Free software for programming and downloading data. 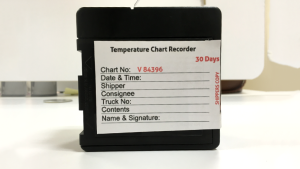 These temperature data loggers are economic models for usage in cold chain applications involving storage and transportation of goods. These are small devices with start and stop buttons. These are easily programmable by the user depending on the applications. There are 5 LED indications which will indicate whether it has ever crossed the programmed limits during the recording time. 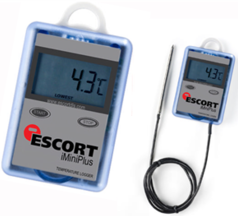 2 Models are available Single use Temperature data loggers. Memory capacity is 7928 readings (55 days of recording if reading is taken every 10 minutes ). 5 LEDs are available on the front side to indicate high or Low alarms. Plug & Play operation without the need of any special software. No software required for taking readings. Simply insert into USB port and pdf, excel & text reports will be automatically generated. Free software for programming sampling rate, alert level etc. The sampling rate can be programmed from 5 seconds to 17 hours. More details can be seen on this page. Dry ice data logger model MP-OE-N-8-L with the external sensor is capable of measuring temperature from -100°C to +40°C. Dry ice is used to transport consignment at extremely low temperatures. Dry ice is solidified form of carbon dioxide and remains at a temperature of -78.5°C. These data loggers come with an external sensor. We can insert this external sensor into the box containing the dry ice. The data logger will be placed outside the box so that reading is visible from outside. This small device which indicates the temperature & humidity on its small screen will be fixed on the wall in patient rooms/operation theaters etc. The device will store data up to 8000 readings and can be transferred to a computer through a wireless system or through a USB connection.
. They are designed for sensing and recording for food items such as meat and liquid, featuring a needle-type sensor. The device enables effective HACCP based systems for food safety, making it ideal for use in food processing environments. This product has been designed to meet IP64 standards (splash resistant; rated for use in daily life). We can transfer the data to a computer through a wireless/WiFi system. This is especially used for processes involving HACCP certification. These are used for monitoring of chemicals. These just indicate whether the temperature has been high or low. There are two types of strips for this purpose. Warm-mark cards are to monitor whether the chemical has been exposed to heat. 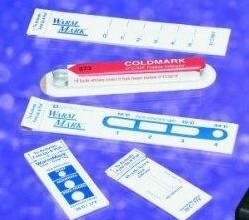 Cold mark cards are to monitor whether the chemical has been exposed to cold conditions. For both the above models, different types of strips are available for different ranges. The color change on the strip will indicate its exposure limits. Response Temperatur range is -18 to 37 degrees C.
Resolution of measurement is +/- 1 degree C.
Shelf Life of these cards is 2 yrs. 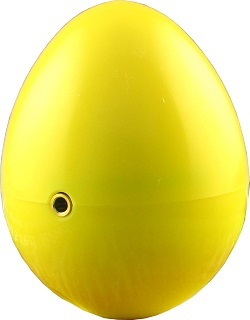 These are egg-shaped and are generally used to monitor the temperature of eggs during shipping, storage, and incubation. Also, these can be used for those areas having space constraints. The data can be downloaded using a software by plugging into the computer. The range of temperature measurement is -20 °C to +60 °C. Memory capacity is 16,000 readings. Start-up method is by programmed time and date or magnet swipe. Vacker Arabia supplies these temperatures and data loggers in all cities of Saudi Arabia covering Jeddah, Dammam, Riyadh, Jubail and Khobar. Disclaimer: All the above logos are the registered Trade Marks of respective companies, the logo is shown only for easy identification of the companies. We have no intention to misrepresent them or make any financial gains by using the above logos in our website.